Sun protection products are vital for children to protect against harmful sun rays and ultra violet light. Even in the UK where our Summers don’t get as hot as other places we still need to protect our children when the weather gets warmer. Unfortunately when children are at school, it’s left to our children to apply their own suncream correctly, something that can be difficult for younger children and something that older children will most probably forget or refuse to do. Calypso suncare product that takes care of these sorts of situations. 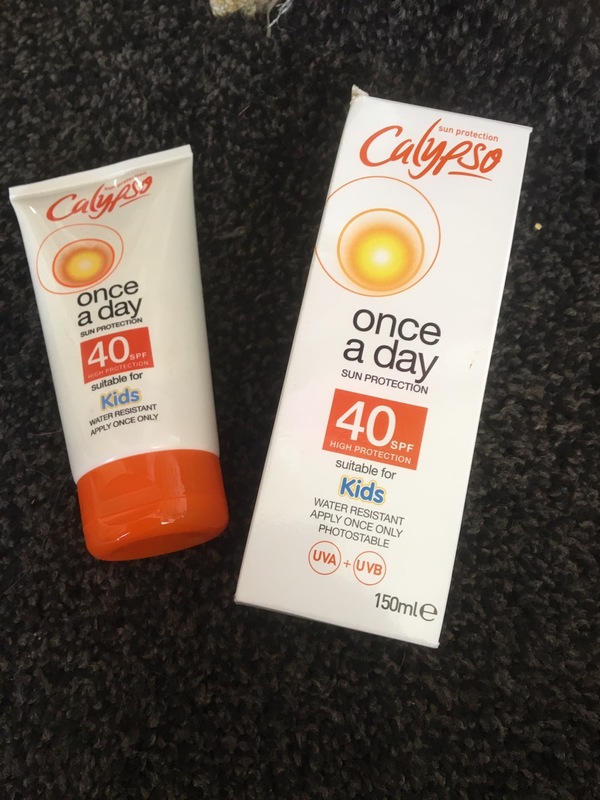 Their once a day kids suncream is factor 40 meaning it’s great for most countries if taking a holiday and also perfect for children in the UK sun too. This has a lovely scent to it which I think may be coconut with something else. When applied correctly, which is 15 minutes before going out in the sun on all exposed skin areas, it will provide an all day protection. It’s also water resistant too meaning children can go in pools and the sea without needing another application. The cream absorbs into the skin and dries really fast, I have tested this myself and found the cream to dry within seconds and no greasiness whatsoever. This sun protection cream is sold in many places and also comes in factor 30 and factor 50. Prices vary but it costs between £5-£8 depending on the store. Nice post 👍 very informative… Also visit my blog and leave your comments….